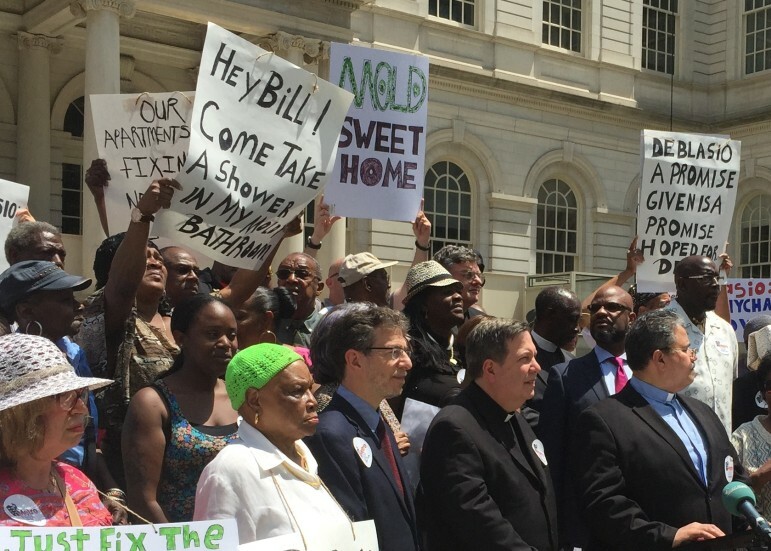 Protesters laid blame for NYCHA's ills on Mayor de Blasio's doorstep. Angry residents and faith leaders joined forces Thursday to call for the resignation of Shola Olatoye, chairwoman of New York City Housing Authority (NYCHA). On the steps of City Hall under a bright sun, hundreds of members of Metro Industrial Areas Foundation called for a “shake up” at NYCHA, demanding that Mayor de Blasio keep his promises to New York City’s most vulnerable population. But the sudden call for Olatoye’s ouster was met with a zealous defense of the chairwoman by at least one frequent NYCHA critic. The speakers’ ire, too, seemed reserved for the mayor, who they felt had made false promises while campaigning, and who they accused of being all talk and no action. But while they were calling for a shake up in leadership and the dismissal of Olatoye, it was with mixed feelings. Specific complaints included the fact that less than 35 percent of repairs are being completed, according to Brawley. Also, the court settlement to eradicate mold and moisture is being ignored while mold continues to grow. Brawley’s demands included the mayor inserting himself directly into NYCHA’s management. “If he believes Ms. Olatoye is not to be trusted with this job, then he should find somebody he does trust or he should do it himself,” Rawley said to much applause. As for the mayor’s plan, NextGeneration NYCHA, speakers and attendees alike were unimpressed, viewing it as a future-oriented plan, when NYCHA stands in crisis now. Within his first months in office, de Blasio began scaling back annual payments NYCHA had long been forced to make for police services—charges that had long irked public housing advocates and exacerbated the Authority’s dismal fiscal situation. This year he increased those rebates to $100 million. The city committed $300 million in capital funding for NYCHA repairs over three years. And, despite the de Blasio-Cuomo tension that has so often stopped Albany from stepping in to help the city, the state also committed $100 million to NYCHA repairs this year. For her part, Olatoye led a year-long outreach campaign around NextGen NYCHA, a plan that actually combines future development with near-term changes to NYCHA management and billing. She also oversaw the controversial and complicated sale of a portfolio of project-based Section 8 buildings to a consortium controlled by the authority and private investors—a move that should improve the authority’s balance sheet. David Jones, the president and CEO of the Community Service Society, said the calls for Olatoye’s ouster were “out of order” and “fail to take into account the dire state of public housing when she took charge a year ago and the changes that have occurred under her watch.”Jones said the chairwoman deserved credit for “engaging residents in the planning of their communities and rebuilding trust” and for her role in “a major tectonic shift away from exclusive reliance on Washington”and toward more city responsibility for NYCHA. 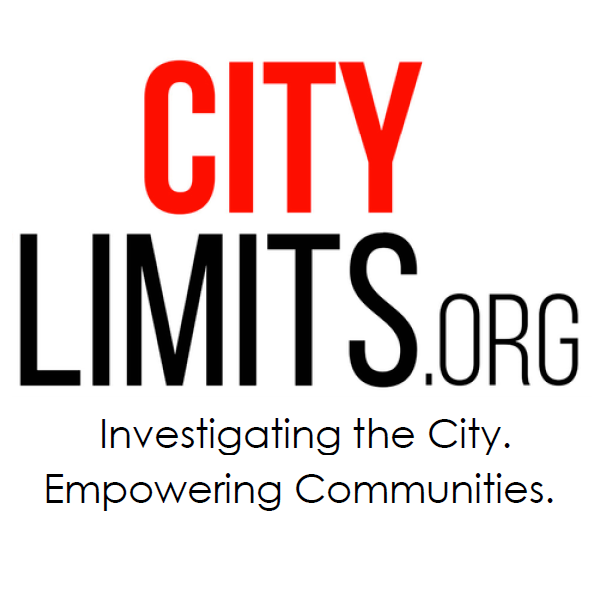 “While continuing resident complaints about the pace of repairs are justified, independent indicators suggest that by 2014, the accelerating deterioration observed since 2008 leveled off,” Jones added. It’s not surprising that the boss of the Metro Industrial Areas Foundation will call for the replacement of the first Black female Chairperson at NYCHA, his ancestors are probably white. This is the same organization that refuse to work with the community at large even though they may have mutual suggestions for an improve quality of life for our people. I don’t really know their game but I think I will google them for more info. Does Albany’s 2015 Ending Mean Progressive Window is Closed? The failure to achieve substantial rent reform, a higher minimum wage and other priorities of the left make some wonder if a brief opening for progressive legislation has slammed shut.